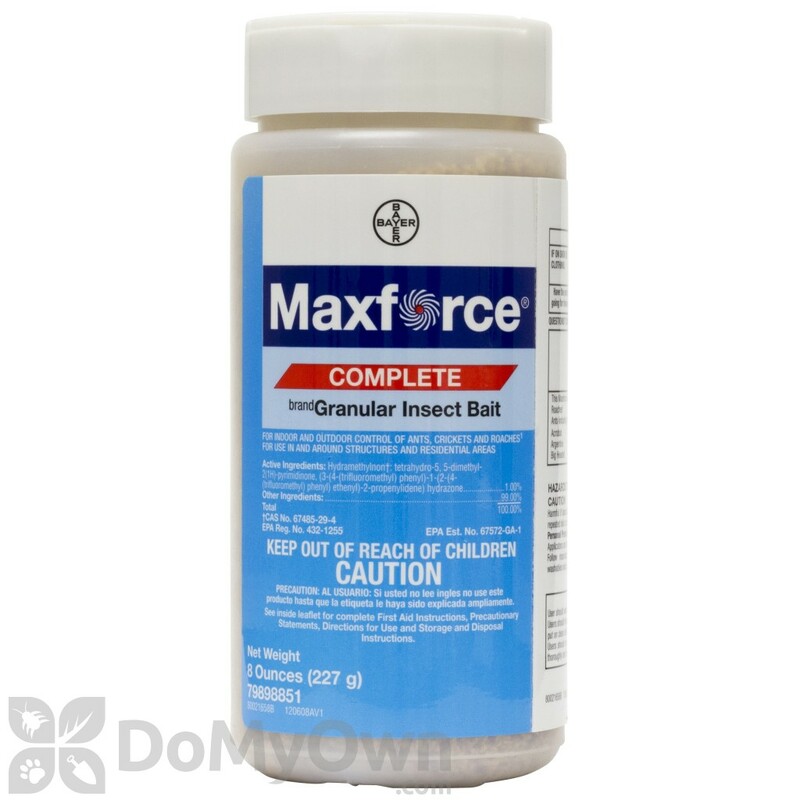 Maxforce Complete Granular Insect Bait is a new bait from Maxforce that contains hydramethylnon and treats a wide variety of crawling insect pests such as ants, silverfish and roaches. Maxforce complete granules contain a unique formula with a mixture of proteins, simple sugars, fats and complex carbohydrates in a food-based granular structure that is irresistible to insects. The great combo of food-based ingredients accommodates the changing food preferences of ant colonies and other insects, delivering superior bait acceptance and control throughout the year! I've read the reviews and most are positive, however this did not work for me. Maxforce with the yellow or green label worked best for me. I've been using maxforce for about 8 years and have had no complaints until I was forced to try this "Maxforce Complete" version. I saw roaches in my kitchen 2 months after putting down this version of maxforce. 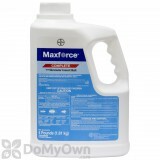 When I use Maxforce with the green label or yellow label I see absolutely no roaches and I apply it about every 10 months. Unfortunately the manufacturer has decided to discontinue the best version of maxforce with the yellow label and green label. This product just did not work for me the way the other maxforce product worked. Did not like this at all. Great stuff! Worth its weight in gold. This stuff is great, great, great. After spreading pine bark mulch in my city backyard, I learned that I had created an awesome roach attraction. Lovely. I went out one night and giant (2") roaches were lumbering around all over my garden, and what's worse, they appeared to be mating. After looking at different products online, I ordered two bottles of this bait. Sprinkled one liberally over my mulch and in a perimeter around the house. After some heavy rains, I added some more about a week later. It's now about 2 weeks since application. Roaches? GONE. I noticed their numbers dwindle somewhat after the first application. Had I been more patient, maybe that would have been enough. But two definitely did the trick. I'll always keep this stuff in stock and once again feel comfortable sitting outside at night...No longer paranoid and looking for those giant suckers! This is a product i will Highly recommend to anyone, very effective and price economical. The fine Granular was the first i tried, it did wonders but i ran out of it this summer. 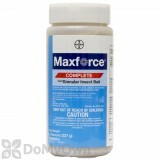 As anyone ever tried using Maxforce Granular Bait in treating Bedbugs? It did worked for me. When i first had bedbug infestation last year, i used Maxforce Granular which i had bought for roaches and it did the magic. These products saved me $$$. I don't generally leave reviews, least of all for ant baits, but I felt I had to for this. We bought a house last winter, and as it got closer to summer and the weather started heating up, the ants started multiplying. Pretty soon we were under attack. They were everywhere, inside the house and out. We tried all the sprays and syrup poisons, but it just seemed to make the problem worse. Then I bought a container of this stuff and sprinkled it outside wherever I saw lines of ants. I checked it out 12 hours later, and it didn't seem like anything was happening. I couldn't even tell if the ants were taking it. Then 24 hours later... all of the ants were gone! It's been a month, now, and we went from spraying gallons of ant poison all over the place for months and still having ants on every surface of our entire house, to just sprinkling a bit of these granules in key places and just one day later, not seeing a single ant anywhere. This stuff is amazing and I highly recommend it. What will kill leaf cutter ants? These have migrated from Texas to west central Louisiana and the area for mounds is very large, 500 sq ft. We saw today, the ants carrying red bud flowers and entering a hole 100' from their mound. We need help and in a hurry. Leaf cutter ants can be a difficult pest to get rid of. The colonies are large and the ants make their own food so poison baits only have limited effects on this species of ants. According to several university websites, Maxforce Complete Granules containing hydramethlynon are some what effective, though they will usually eliminate only about 30% of a large colony in one treatment and will need to be reapplied several times. DeltaGard granules is one of the only products actually labeled for leaf cutter ants. The product label recommends treating the mound directly and lightly watering the granules in. Again, it may take several treatments to get the desired results. We also recommend contacting your local cooperative extension office to see if they have any recommendations for products that have worked for other people in your region. How safe is Maxforce Complete Granular Bait when used around cats and dogs? We just moved into a house in south fl which has a 2.5 acre yard overcome by ants. They are everywhere. We built a 35 x35 enclosure to allow our cats and dogs out. A couple of cats prefer to be out there 24/7. How safe is this product for my cats and dogs if I sprinkle it on the deck and in the yard they live in? I don't want anything remotely dangerous to them. If this is not the right product, can you suggest another? Maxforce Complete Granular Bait is safe for pets when applied as directed. It is such a small amount of active ingredient it should not harm pets. You may also want to try bait stations. Maxforce Complete Brand Granular Insect Bait may be sprinkled around structures and/or applied to refillable/serviceable bait stations as outlined below. Sprinkle this product evenly in a 1-2 foot wide band adjacent to the structure at a rate of 0.5 oz (one tablespoon) of bait per 25 linear feet. NOTE: Around structures the total application should not exceed 4-8 oz per 200-400 linear feet (or 0.5 oz per 25 linear feet). A typical application would be 4-8 oz adjacent to an average sized home of 200-400 linear feet. Be sure to treat areas such as porches, patios, driveways, sidewalks, flower gardens, landscape timbers and around trees, wood piles, air conditioning units and garbage receptacles. Does rain affect Maxforce Complete Granular Bait ? Should I put more after days of rain? Rain can cause the Maxforce Complete Granular Bait to wash away or get moldy which makes it less attractive. We do recommend re-applying the bait after heavy rains. I used to use MF Fine Granule with great effect on Argentne ants. Is Fine Granule still available, and is this new version small enough granules to work well on Argentine ants? 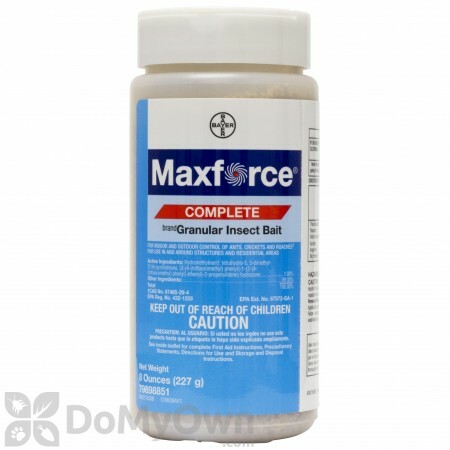 The Maxforce Complete has replaced the previous versions of the Maxforce granules that covers a wider range of ants, including argentine, as well as other insects, and is a mixture of both fine and medium sized granules. You will get the same control with these as you did with the fine which is no longer available. I have noticed birds picking around in my lawn where I sprinkled this stuff and I really do not want to harm them. Will this kill birds or harm them? Maxforce Complete Granular Bait is only large enough to kill small insects, it could still harm birds. If they consume large amounts, or are especially sensitive. We recommend to try and use the products in areas the birds could not get to.